I’m reminded recently that we are in the months of winter. Up until now, Tulsa has had a fairly warm season and there hasn’t been much need to run to those typical comfort foods. But now, I’m cold! I wake up cold, I turn on the little heater next to my desk to warm my toes, I keep a hot coffee with me most of the day (it’s like a hand warmer with benefits). Because of that internal chill that is so difficult to shake, I’m starting to turn to soup and stew and chili to warm myself and my family on the inside. 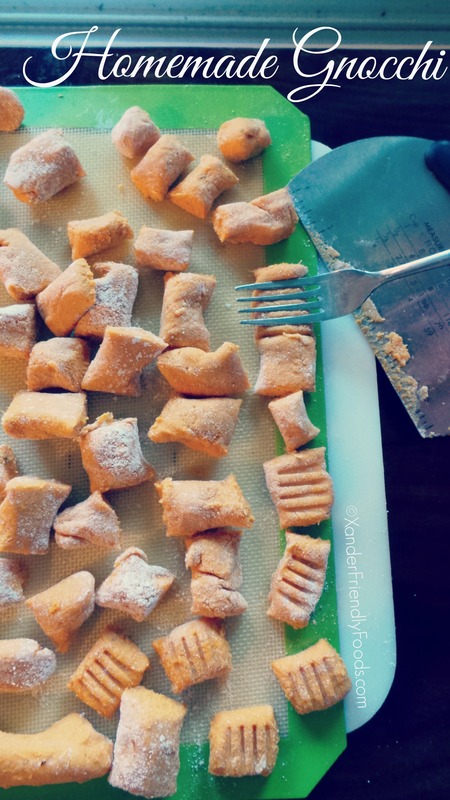 This Sweet Potato Gnocchi did the trick! Not only was it nice and hot, like most soups should be, but the combination was quite enjoyable. I never had gnocchi in a soup before but I wanted to do something other than topping it with pasta sauce (although that would be delicious as well). It’s actually quite simple to make as well. Start by sautéing the onions to bring out the flavor then add the garlic for the last-minute, just until you start to smell the aroma of it cooking. Add to the pot the vegetable broth, herbs & spices, sweet potato and simmer until those soften. Toss in your gnocchi , and let that cook according to package directions (usually 2-5 minutes). At the end, I add in the coconut milk, just to make it a little creamy, then throw in the spinach leaves. Those will turn bright green almost instantly so no need to keep cooking. In case you just so happen to have your own homemade Gnocchi on hand, feel free to use that instead. If you want it a little creamier, simply add a dollop or 2 of sour cream (I actually added a scoop of Tofutti to mine). Ladle into bowls & sprinkle with a little garnish, then “wahlah”! Warm & comforting, creamy and delicious Gnocchi Soup, amped up with a little sweet potato & spinach. Delish! And if you’re feeling really lazy, simply throw everything together (less the gnocchi & spinach) and allow to simmer until softened. Add the gnocchi during the last 5 minutes then toss in the spinach right before serving. 1 pot, simple & absolutely perfect for this time (or ANYtime of year). Rich & creamy, comforting, Sweet Potato & Gnocchi Soup. Free of Top 8 allergens and simply delicious! Heat your stock pot to medium high. Start by sautéing the onions in coconut oil to bring out the flavor then add in the garlic for the last minute, just until you start to smell the aroma of it cooking. Add to the pot the vegetable broth, red pepper flakes, salt & pepper, then toss in diced sweet potato and simmer until those soften (10 min). Carefully add your gnocchi to the pot, and let that cook according to package directions (usually 2-5 minutes). During the last few minutes, add the coconut milk, just to make it a little creamy, then throw in the spinach leaves. Those will turn bright green almost instantly so no need to keep cooking. If you want it a little creamier, simply add a dollop or 2 of cream cheese (I actually added a scoop of Tofutti sour cream to mine). Ladle into bowls & sprinkle with a little garnish of fresh basil. Change up your greens by using torn kale leaves instead. They won’t wilt as much so you’ll have a little extra texture. Tastes great as a broth base, however, it is especially delicious when sour cream is blended in during the final step. Fabulous soup! I love gnocchi and just started making my own recently! So did I, although I haven’t posted on it yet. Do you use regular white potatoes or sweet potatoes? I used sweet and they were soooo good.